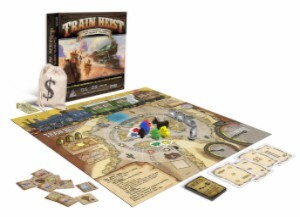 Cryptozoic Entertainment, leading creator of board games, trading cards, and collectibles, in partnership with Tower Guard Games, today announced the July 26 release of Train Heist. In this cooperative board game, 2-4 players become cowboys in the Old West who must work together to stop the corrupt Sheriff and the rich folks of Notting County from stealing all of the townspeople’s earnings. Creator Sean McDonald ran a successful Kickstarter campaign for the game in 2015 that earned double its initial funding goal, numerous positive reviews, and a place on BoardGameGeek’s “Hotness” list for most of that year. Subsequently, Cryptozoic agreed to publish Train Heist in an effort to bring the game to a wider audience, working with McDonald to refine gameplay. Train Heist features wooden cowboy miniature figures, which can be used to move across the map, ride one of the two horse miniatures, and hop aboard the moving train, represented by five miniature train cars that travel between the towns on the map. After entering the train, the players move their figures to the top part of the game board, which provides a view of the inside of the train. Players then move their cowboys from car to car and loot the wealthy passengers—with certain poker hands allowing players to steal certain loot—all while evading the ever-watchful Sheriff. Making the game even more complex are Event Cards, which can cause the train suddenly to speed up or switch tracks. Other features on the map are Crackpot Canyon, natives, and a tunnel, which will knock a cowboy off if he is on the roof of the train or help a cowboy escape the Sheriff if they are both inside the train. Plus, there’s a deck of Wanted Cards that give players colorful nicknames and special abilities if they perform impressive feats that bring them renown. Players win if they acquire enough loot for the Train Heist Goal Marker to reach the goal set at the beginning of the game. Players lose if the train stops at a town without loot too many times, causing the Hangman Marker to reach the noose. 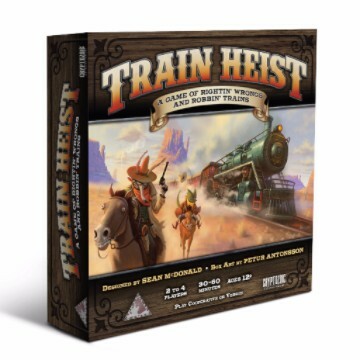 Train Heist will be available at retailers nationwide on July 26 for $45. Will you be picking up a copy? Let us know in the comment section below.